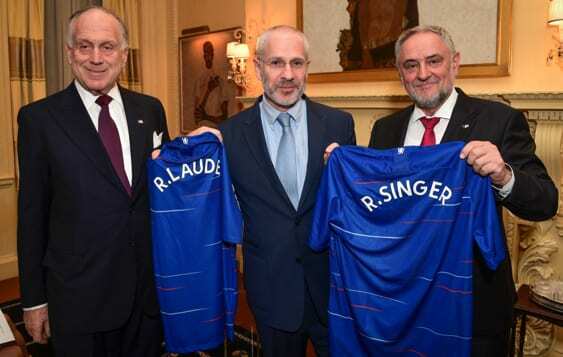 The World Jewish Congress and its President Ronald S. Lauder, together with senior officials of the top English soccer team Chelsea Football Club have announced that they will convene an international summit in 2019 to battle discrimination, racism and antisemitism in sports. WJC and Chelsea officials made the announcement during an exclusive VIP cocktail reception at Ambassador Lauder’s New York City home tonight, which was held to promote “Red Card For Hate,” a Chelsea-WJC initiative which aims to promote a global dialogue to combat all forms of hatred in sports. The summit, which is set to take place in Paris, will gather sports ministers and other government officials from around the world, together with the leaders of national soccer associations, heads of major soccer clubs, soccer players, UN agencies, and representatives of civil society. They will share their best practices for combating discrimination and set the stage for dialogue and collaboration around the issue. They will also aim to create a network dedicated to enhance the fight against racism and antisemitism in sports, primarily in soccer. “Today, we are ready to roll out our vision for a unique international summit aimed at freeing sports of hatred, racism, discrimination, and antisemitism, to ensure that the comradery and spirit of sport are embraced with bridges, not divides,” said Lauder. “We also hope that this initiative will encourage more clubs to create their own projects as well as working together with us on joint campaigns and activities,” Buck said. Soccer, especially in Europe, has been plagued by instances of antisemitism and racism for years. Fans have led anti-Semitic chants, including making hissing noises to evoke the Nazi gas chambers, and targeted African and black players with monkey sounds, among other offensive actions. Ultra-nationalists and neo-Nazis have also played roles in supporter groups for various teams.